Our friends over at Dyspla, are always beating the drum for dyslexic writers. When looking through the great resources and content on their site we came across this cool little project (thank you Dyspla). 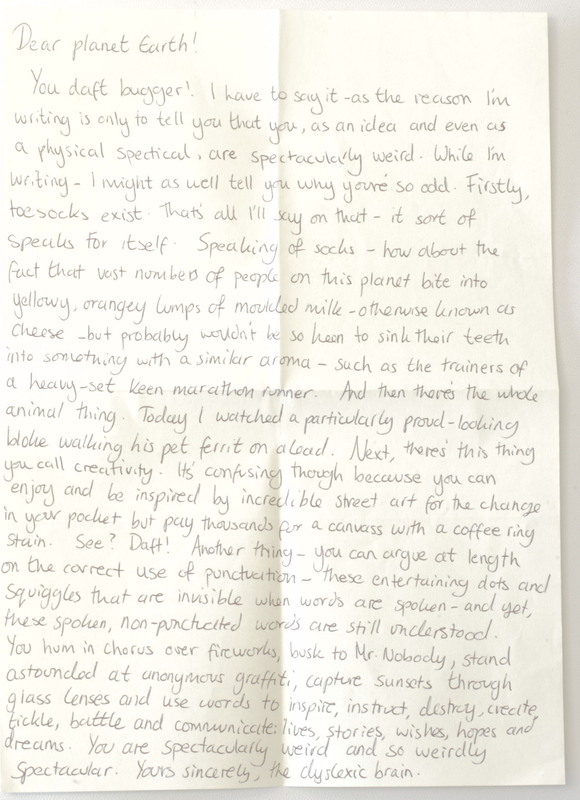 The Letters Project is Dyspla’s way of engaging with as many dyslexic writers from around the world as they can. Dyspla invite dyslexic’s for across the planet to submit work for inclusion in the project. This can be a letter, drawing, painting, poem, short story, or anything else that can be popped into an envelope. The only requirements are that the work is original, handmade, and spell check is not allowed; If submitting a letter, it must be handwritten. Each month we’re doing our bit to promote Dyslexic writing by showcasing some of our favorite letters and artwork from the project. This letter will have you laughing out loud, and if you’re in a public place, you’ll probably be seen as insane, but it is still worth it. In this letter, we see the writer thanking (or perhaps not thanking) Mother Nature for their dyslexic mind. You get the sense that this person is quite interested in their dyslexia (who wouldn’t be?). Click here to see all submissions for this project. Curation and words by Vanessa Rocha our resident Lexic (or if you’re a film buff, you might want to check out her review blog Ereimul Reviews).